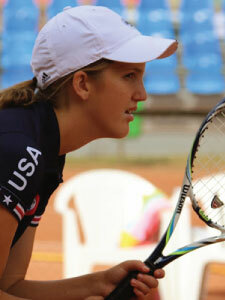 Katherine is a multi-sport athlete in Tennis & Equestrian. A founding player on Athletes Without Limit’s first National High-Performance Tennis Team for players with intellectual disability, Katherine has traveled with the team to the Australian Tennis Championships at the 2013 Australian Open, the 2014 Inas Tennis World Championships in France, and the 2015 Inas Global Games World Championships in Ecuador. Katherine and teammate Brittany Tagliareni were the first ever US female athletes (out of all sports) to secure an individual Inas World Title when they took gold in the Women’s Doubles with at the 2014 Inas Worlds in France. Visit our Facebook page for updates about Katherine’s results at the recent 2015 Global Games in Ecuador. She’ll next represent the US Team at the 2016 Inas World Championships hosted by Athletes Without Limits at Sea Colony, Delaware. My Mom and Dad play tennis and so I started playing. What places have you traveled to for competition? I have been to many cities in the United States. I have also been to Australia, France, Italy and was very excited to recently travel to Ecuador. I have played many sports, but my favorite ones are tennis and horseback riding. I also volunteer at The Houston Police Department, Mounted Unit. I have been doing this for 4 years. My friends and I sponsor a police horse named, Smash. We were awarded the Houston Police Department’s Humanitarian award in 2014. I enjoy repelling and have gone down 21 buildings. I play tennis almost everyday. I also do weight training and some yoga. Even horseback riding is part of my training program. It relaxes me. I like to mix up my training. It makes it more fun. What do you find hardest about training? Learning a new shot, but getting excited when I accomplish it. What are your goals for your next big event or other future aspirations? Being the best player I can be for the 2016 Inas Tennis Worlds in Delaware. What is your favorite saying, quote or mantra? Always try your best. It’s about having fun. Who are your favorite athletes for inspiration? I like Andy Roddick. I played with him in an exhibition match. What is your favorite pre-race meal or ritual? What are the names of other teams you have been on? In additional to being a high-performance athlete do you have any other occupations?